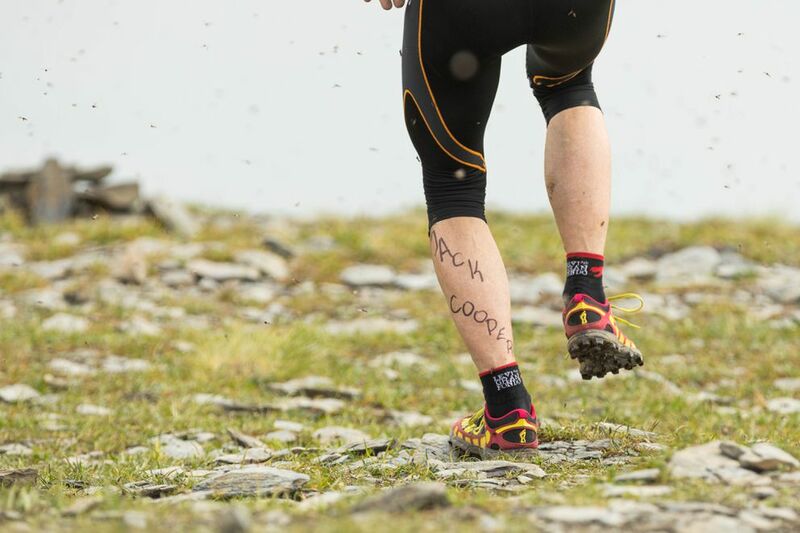 Annie Connelly of Chugiak ran with JACK written on the upper left side of her back and COOPER written on the upper right side to honor Patrick "Jack'' Cooper, the 16-year-old from Anchorage who last month was killed by a black bear shortly after finishing the junior race up Bird Ridge. Many other racers also wrote Cooper's name on their bodies. Connelly said she got the idea from family friend and fellow racer Karen Kirk. Kirk, who raced with JACK written on the side of her right arm, said Connelly is a thoughtful young woman who was torn up by Cooper's death. "I wanted to give her something to hang onto,'' Kirk said. Cooper's death hit Connelly especially hard, in part, because she and her mother, Claire, endured an encounter with a brown bear sow and two cubs three days before Cooper's death while descending Bear Mountain near their home in Chugiak. Annie Connelly said the family dog, Bronwyn, a red-nosed pit bull along on the workout, immediately ran at the sow – "No hesitation'' – and distracted it while the two women retreated. "I immediately told Annie to dial 911,'' Claire Connelly said. Claire said she heard Bronwyn "scream'' when she and her daughter could not longer see the dog or the bears. Mother and daughter assumed the worst. But about 20 minutes later, Claire said, Bronwyn found the Connellys. Because the Connellys were out of dog treats when Bronwyn returned home from the veterinarian, they gave her a different sort of treat. "Bacon for life,'' Annie said. You'd think that Mount Marathon already produces enough misery and suffering with its leg-busting uphill and knee-shattering descent. But nature threw an extra wrinkle at women's racers Tuesday morning: swarms of insects that one athlete likened to a "plague." "Bugs in my eyes. Bugs in my mouth," said Denali Foldager-Strabel, 27, who finished fourth. "There were bugs everywhere on me." The insects didn't bite and weren't mosquitoes — they were "creepy fly-looking things that just stick on you and they don't get off," said Sable Hodson, 26, who finished 170th. She said the insects descended on women as soon as they climbed above treeline, about one-fourth of the way up the mountain and subsided near the halfway point. "The girls in front of me, their whole backs were covered with bugs. It was disgusting," Hodson said. "Trying not to eat them as we're breathing and stuff." Another woman guessed she spat out five of them. There wasn't much else to be done — it's not like you can train to practice inhaling insects while racing — and Hodson said they even provided a little bit of extra motivation. "It kept us all moving," she said. "We wanted to get out of the clouds of them." Mount Marathon often exacts its toll in flesh and blood, and fifth-place women's finisher Ann Spencer sported twin, thin rivulets of blood down each shin. Spencer, 22, said she skinned her knees in a high-speed fall during the descent. She tumbled forward just past halfway down the mountain, where a field of scree gives way to a gully.